With more than 9,000 men expected to be diagnosed with testicular cancer this year, it’s important to be on the lookout for the early warning signs. In today’s post, we’ll explain a few of the most prominent signs of testicular cancer. Men’s Vitality Center in Tempe is your go-to resource for men’s health services. Whether you need a physical exam or monitored testosterone replacement therapy, we’re here to help you live a healthy and happy life. Call 480-588-2430 to schedule an appointment, and read on to learn more about testicular cancer. Physical exams are your first line of defense against testicular cancer. 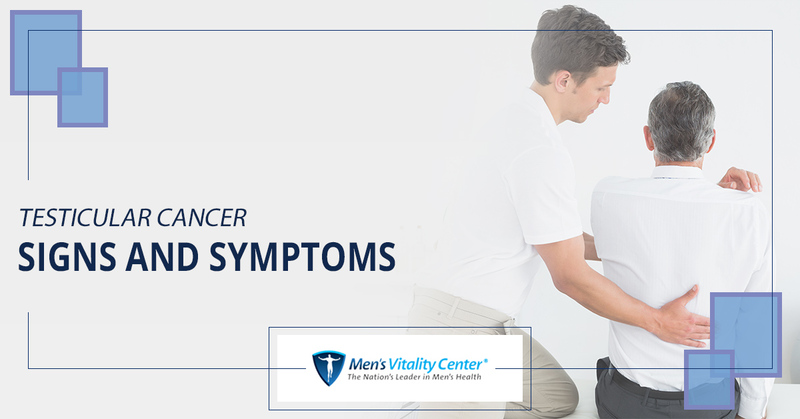 Your men’s health provider knows exactly what to look for, and they can also help you determine the right course of action for the symptoms you’re experiencing. You don’t get weekly physicals, however, so you should get into the habit of performing self-exams every month. Check for lumps, swelling, and protrusions in the shower, and always be sure to contact your doctor if you’re concerned about your health. Even if your symptoms turn out to be completely benign, it’s always best to err on the side of caution. Ultrasound: Ultrasounds use sound waves to create a detailed image of the inspection area. This test will help your doctor determine if a lump is on the inside or outside of the testicle, as well as whether it is a solid mass or a fluid-filled protrusion. Blood exam: Blood tests are sometimes used to test for indications of a tumor. Your doctor will be looking for elevated levels of certain substances that normally occur when a tumor is present in the body. Elevated levels of these substances do not always indicate that a tumor is present, but this knowledge can help your men’s health expert determine the next steps in your treatment. Surgery: Your doctor may recommend that the testicle with the tumor be removed. Depending on whether the mass is cancerous, you may need to have lymph nodes in the area removed as well. Radiation: Radiation therapy utilizes energy beams to destroy cancerous cells in the body. Chemotherapy: This treatment option uses various drugs to destroy cancerous cells. This form of cancer treatment is particularly effective if your doctor believes that the cancer may have spread beyond the testicles. Men’s Vitality Center is your top men’s health resource in Tempe — whether you need testosterone replacement therapy or you need to talk to a men’s health provider about a new symptom you’re experiencing, our experts are always here for you. Fill out the form below to schedule an appointment.